Amid a surge in upscale demand that shows no sign of ending anytime soon, Tequila sales are booming in the U.S. market. Interest in high-end Tequilas (Casa Herradura jimador pictured) has soared in recent years. The afternoon sunlight is scorching the Tequila Highlands, but within the walls of Hacienda Patrón, the world’s leading luxury Tequila maker, all is cool and sheltered. In the distillery’s cavernous aging room, the sweet scents of wood and slumbering agave spirit fill the darkened, hushed air. “This is my chapel,” smiles Francisco Alcaraz, Patrón’s master distiller, looking up at the barrels that line the cavernous space. He speaks in whispers, as if careful not to disturb the resting liquid. There’s much discussion about Alcaraz’s latest creation—a Sherry Cask Añejo that’s been aged in Oloroso barrels for over two years. It’s the first entry in a new tier called the Patrón Cask Collection, whose name promises more to come. Sherry Cask Añejo is currently available in travel retail at around $90 a 750-ml., and its U.S. arrival is expected soon. Also resting in the barrel hall are Tequilas that will compose the Gran Patrón collection, the distillery’s top tier. Those offerings include Gran Patrón Piedra ($400 a 750-ml. ), made using a 2-ton, volcanic stone milling wheel called a “tahona,” which crushes the cooked agave and extracts its juices in the traditional fashion. After distillation, Gran Patrón Piedra is aged for four years in French Limousin and new American oak. There’s also Gran Patrón Burdeos ($500), a triple-distilled Añejo finished in Bordeaux barrels and packaged in a Cognac-like crystal decanter. The third entry in the Gran Patrón line is Platinum ($200), a Silver Tequila that’s also triple-distilled. A generation ago, the presence of such luxury items in a Tequila portfolio was limited, to say the least. Mixto Tequilas—those containing at least 51-percent blue agave and 49-percent cane spirit—were the norm for decades. 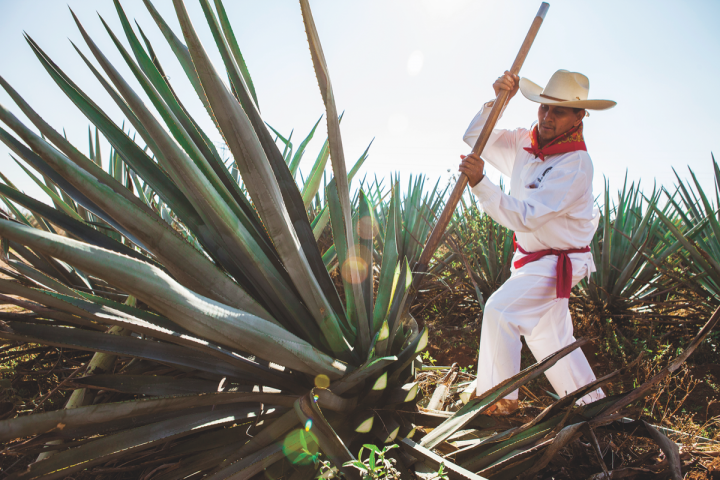 Today, higher-end 100-percent blue agave Tequilas are spearheading a remarkable growth drive. Since 2005, total Tequila exports to the U.S. market have nearly doubled to almost 18 million cases, with the lion’s share of that increase coming from 100-percent blue agave labels. For U.S. suppliers, that trend has been a boon to the bottom line. According to the Economic and Strategic Analysis Department at the Distilled Spirits Council, gross U.S. supplier revenues of Tequila (including federal excise tax) have risen by nearly 160 percent since 2003—from $962 million to almost $2.5 billion last year. Leading the charge are super-premium-and-above Tequilas (priced higher than $240 a case by suppliers), whose sales have risen from $142 million in 2003 to more than $1 billion last year—an increase of 641 percent. Indeed, there’s room to roam: Tequila currently comprises only about 7 percent of total U.S. spirits volume, according to Impact Databank, compared to 34 percent for vodka and 9 percent for Bourbon. And at the super-premium and luxury tiers (above $25), Tequila’s 5.8 million cases are eclipsed only by vodka at 6.4 million cases—and vodka’s premiumization has slowed considerably in recent years. Tequila’s super-premium tier alone (between $25 and $40) totaled 2.6 million cases last year and rose by an aggregate 11 percent, according to Impact Databank. Among the super-premium top players, Cuervo’s 1800 brand cracked the 1 million–case mark, while competitors Cazadores, Milagro, Espolòn and Olmeca Altos all posted strong double-digit growth rates. 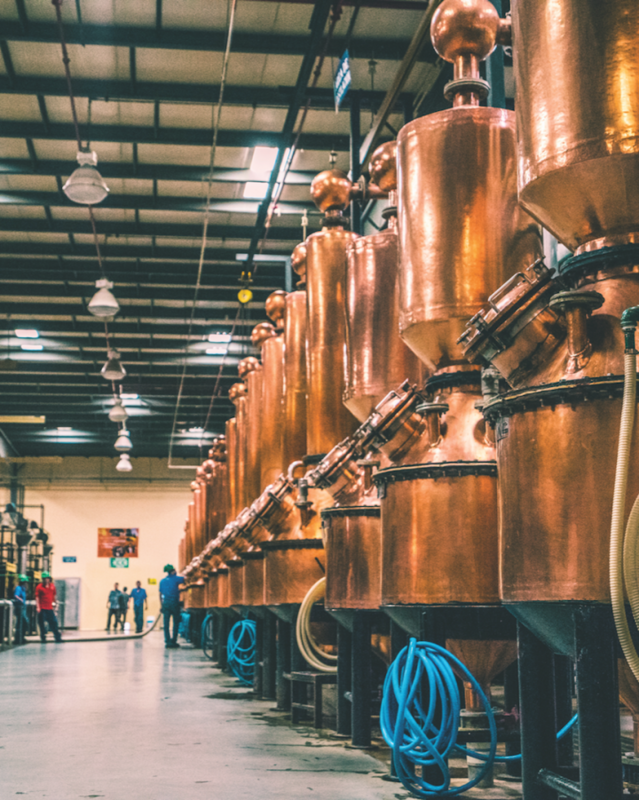 Patrón's distillery uses small-capacity copper stills to make its Tequila, which ranges in price from $45 to $500. Among luxury Tequilas (above $40), volumes advanced by 11 percent to 3.2 million cases in the U.S. market last year. The luxury segment now comprises about 21 percent of the Tequila category in the United States, up from 13 percent a decade ago. Patrón, creator of the luxury movement, remains its dominant player with a 70-percent share. Last year, the Patrón portfolio posted another stellar performance, advancing by nearly 10 percent to 2.3 million cases. The core Patrón expressions are Silver ($45), Reposado ($50) and Añejo ($55), and the brand launched Roca Patrón three years ago. Made using the tahona process, Roca Patrón features Silver ($70), Reposado ($80) and Añejo ($90), with the latter two expressions aged in single-use Bourbon barrels for five months and 14 months, respectively. Last year, Roca Patrón rose by 16 percent to 44,000 cases in the U.S. market. While Patrón’s position remains unassailable, the competitive field is growing fast. Three luxury competitors—Don Julio, Herradura and Casamigos—advanced at double-digit rates last year, albeit from smaller bases. Don Julio’s most upscale labels include the signature Don Julio 42, a 30-month Añejo that’s among the more sought-after luxury labels at $100-and-over, as well as Don Julio Real, an Extra Añejo that’s aged 40 to 45 months. While Patrón might be the dominant luxury player, Casa Herradura launched the world’s first aged Tequila, a Reposado, in 1974. It also pioneered the Extra Añejo category with the 1995 release of Seleccion Suprema ($350), its highest-priced expression, which is barrel-aged for 49 months. Seleccion Suprema was initially classified simply as an Añejo, but Herradura appealed to the Consejo Regulador de Tequila (CRT) for the new designation of Extra Añejo, which was finally granted in 2006. “We’re proud of making the Tequila industry’s first Reposado and its first Extra Añejo,” says Ruben Aceves, Herradura’s master taster and director of international brand development. 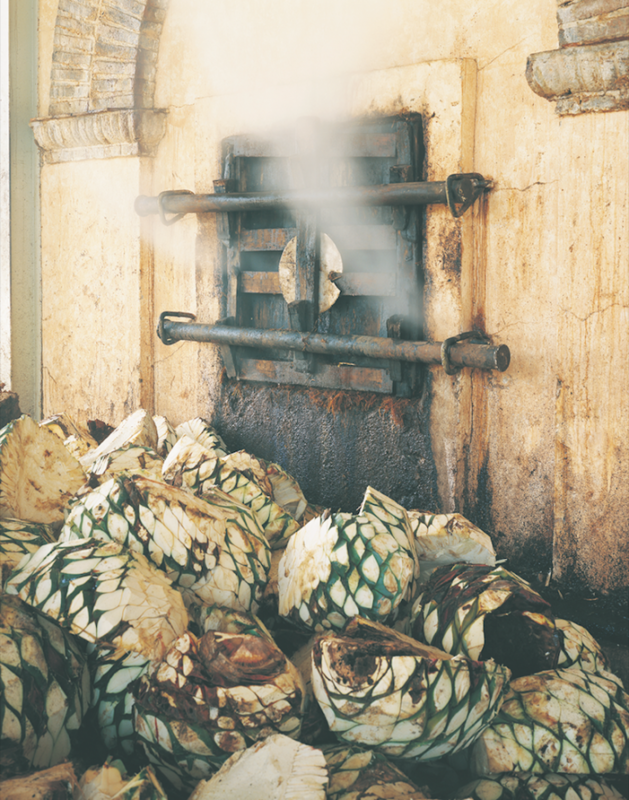 Herradura (agave ovens pictured) was an early mover in aged Tequilas, pioneering the Extra Añejo classification with its Seleccion Suprema label. Herradura also excels at the art of cask finishing, particularly with its Colección de la Casa ($90)—an annual limited release of just 13,000 bottles. The first offering came in 2012 with a Reposado finished for two months in Port casks and was followed in 2013 by a Reposado, which is aged in American white oak barrels for 11 months and finished in French oak casks for three more. The 2014 Colección de la Casa release was a Reposado aged for 11 months in American white oak barrels and finished for three months in single malt Scotch casks from the Highlands and Islay. “In 2015, we went in the opposite direction and released Directo de Alambique—a Silver Tequila bottled direct from the still at 55-percent abv that was meant to be a permanent expression,” Aceves says. Directo de Alambique did become a permanent SKU in 2015 and retails today at $90. The Port Cask Finished Añejo was the most highly acclaimed of the Colección de la Casa series, and it was brought back as the 2016 release. Though there has been talk of making it a permanent SKU, that hasn’t yet happened. Tequila’s arrival on the global luxury stage is perhaps best signaled by the entry of Moët Hennessy. In May, the company launched Volcan De Mi Tierra, produced in a joint venture with the Gallardo family, whose lineage in Mexico dates back to the 17th century. 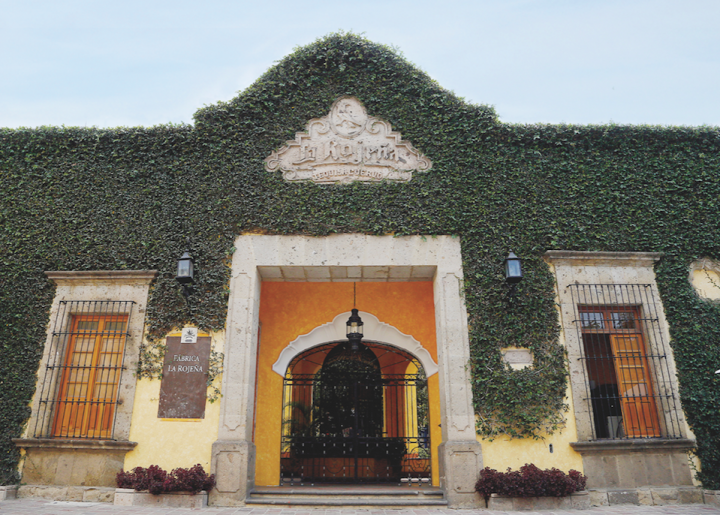 The partners chose a distillery near the town of Huaxtla in Tequila’s Lowlands valley—not far from the Volcan de Tequila, a long-dormant volcano that’s Jalisco’s most famous landmark. “We looked at many properties—small, medium and large—before acquiring this distillery, which was a great, family-owned working facility that simply needed the love and attention that we could give to it,” says Trent Fraser, the joint venture’s president and CEO. To oversee production, Moët Hennessy has tapped Ana María Romero Mena, one of the Tequila region’s few female master distillers. Romero Mena has created what she sees as a unique blend of the two principal Tequila terroirs: the Lowlands, which are northwest of Guadalajara and around 3,600 feet above sea level, and the Highlands, which are east of Guadalajara and rise to more than 6,000 feet. Highlands agave has a floral, fruity and sweet flavor profile, while the volcanic soils in the Lowlands produce an earthier, more herbaceous style. While Moët Hennessy’s entry is significant, Diageo made an even bigger splash in June with the announcement that it’s acquiring the Casamigos Tequila brand for an upfront price of $700 million, plus $300 million in potential payouts based on future performance. Casamigos launched in 2013 amid great fanfare, mainly due to its glamorous ownership team, which is led by actor George Clooney and nightlife entrepreneur Rande Gerber. Clooney’s cinematic resumé is well known, while Gerber is the founder of nightlife company Gerber Group. 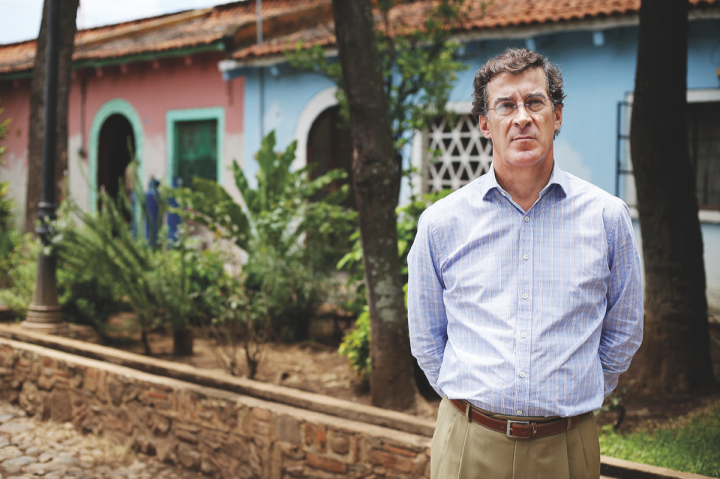 Third partner Mike Meldman founded Discovery Land Company, a leading real estate concern that develops private golf club communities across North America. Casamigos’ founding partners will have “active participation” in the future direction of the brand, Diageo says. With Clooney and Gerber as the face of Casamigos thus far, their continued involvement will likely be key to its future. Casamigos Spirits CEO Lee Einsidler will stay on, and the brand will be run as a separate unit. Retailing between $45 and $55 a 750-ml., Casamigos offers a Blanco, a Reposado and an Añejo. The brand has posted average annual compound growth of 54 percent over the past two years, and last year reached 120,000 cases, primarily in the U.S. market. For 2017, it’s on track to reach between 175,000 and 200,000 cases. Diageo has set a five-year goal of reaching 1 million cases and establishing a major presence in the luxury Tequila segment with Casamigos. 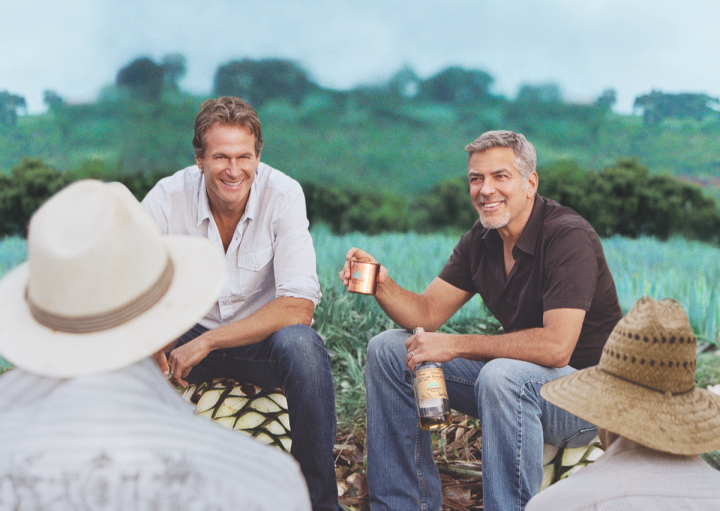 Founding partners Rande Gerber (left), George Clooney (right) and Mike Meldman (not pictured) sold Casamigos to Diageo for $700 million, with $300 million more based on future performance. 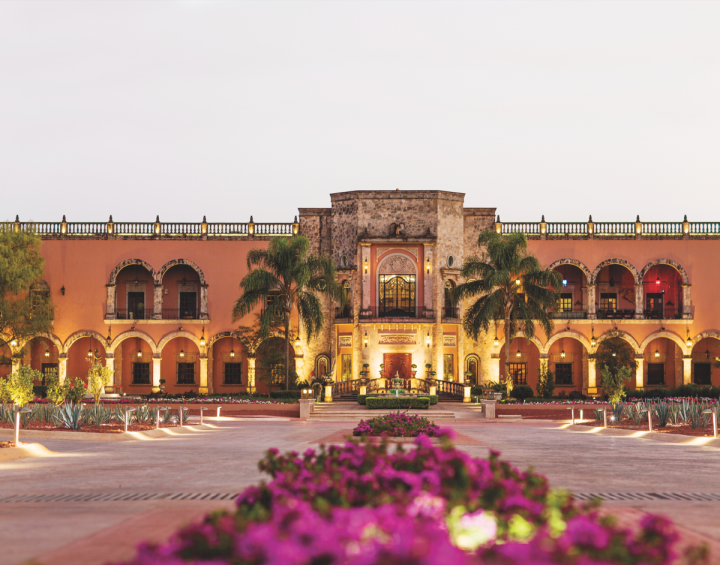 Moët Hennessy's launch of its Volcan De Mi Tierra brand this psring is a clear sign of Tequila's arrival on the global luxury stage. 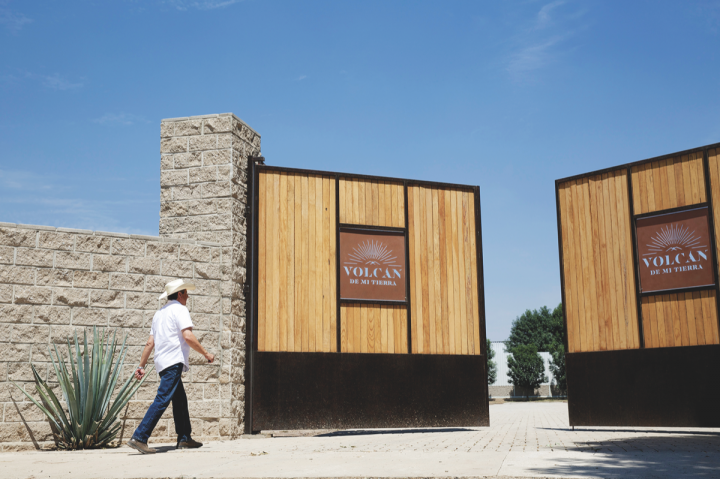 The new Volcan De Mi Tierra distillery (pictured) hs produced two expressions thus far: a Silver ($40) and a Cristalino ($60). Amid all the enthusiasm for aged and cask-finished Tequila expressions, there’s still a robust consumer preference for Silver. That trend isn’t wholly price-driven, as many Tequila lovers simply prefer it as being truest to the agave taste. Unaged variants still account for around 60 percent of U.S. Tequila sales, by most estimates. “Even amid the current love of brown spirits, Tequila consumers continue to prefer Silver,” says Christine Moll, category director for Tequila at Campari America, marketer of Espolòn. Herradura brand manager Jennifer Simmonds agrees. “We’re seeing progress across all our expressions, but most growth is coming from Silver,” she says. 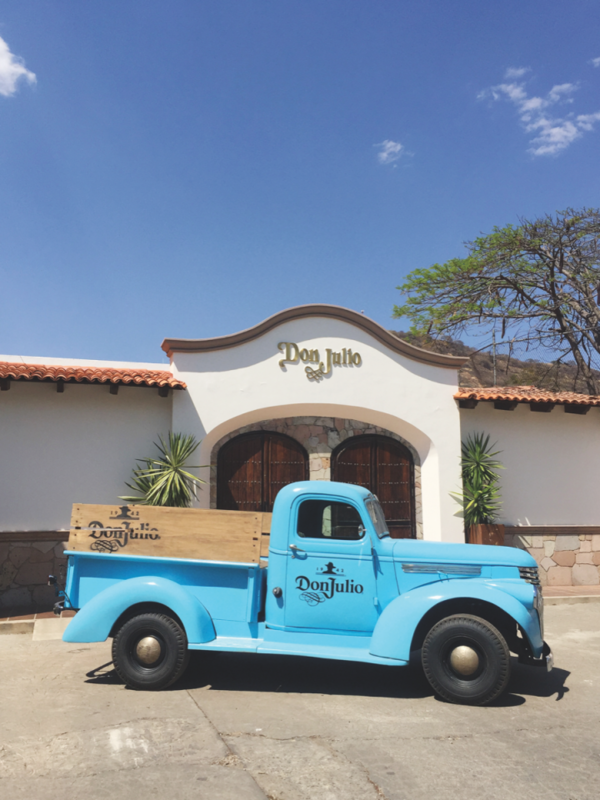 The Don Julio distillery (pictured) produces a lineup led by Don Julio 1942, one of the most sought-after luxury Tequilas on the market. One Tequila style getting greater attention these days is Cristalino, a relatively new expression that has yet to be officially classified by the CRT. It’s an aged Tequila that’s charcoal-filtered—a process that removes the color and strips out some of the wood compounds that result from barrel aging. Don Julio launched the concept in 2011 with Don Julio 70, a limited-release developed to celebrate the brand’s 70th anniversary the following year. Competitors in Cristalino today include Cuervo-owned labels Maestro Dobel Diamante and 1800 Cristalino. Casa Cuervo chief executive Juan Domingo Beckmann told shareholders recently that Cuervo is now placing “significant efforts” behind the Cristalino style. Herradura, which launched the Cristalino expression Herradura Ultra ($60 a 750-ml.) in 2015, is also very much in the mix. “We decided to do this expression in a more sophisticated way,” Aceves says. “Herradura Ultra is a blend of three Tequilas—one aged 12 months, one aged 25 months and an Extra Añejo, which is aged 49 months. We also sweeten it with some agave nectar, and then run it through the chill-filtration process.” Brand owner Brown-Forman appears to be expecting big things from Herradura Ultra in the U.S. market. 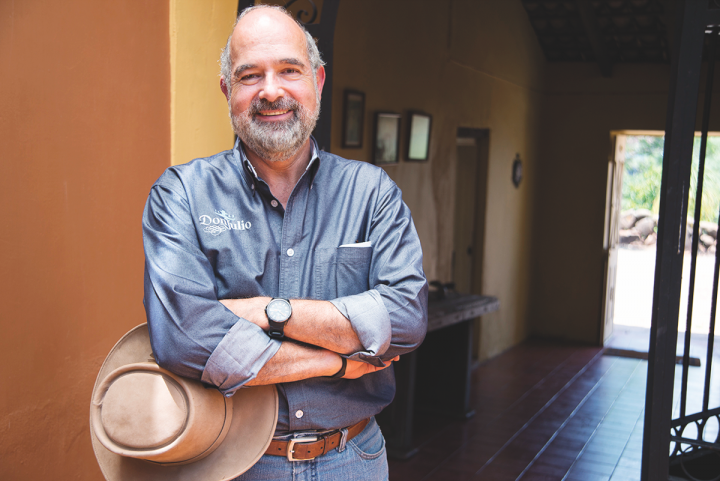 Don Julio master distiller Enrique de Colsa (pictured) created the first Cristalino Tequila expression in 2011. The newest Cristalino entrant is from Moët Hennessy’s Volcan De Mi Tierra brand, whose Cristalino also retails for $60. It’s a mix of 70-percent Añejo and 30-percent Extra Añejo, with an additional 30 days of barrel-aging after charcoal filtration. It’s worth noting that charcoal-filtering doesn’t create a uniform product, as there are differences between the various Cristalino expressions. Volcan De Mi Tierra’s Cristalino, for example, isn’t entirely clear, but has a light golden hue. Its taste profile is also different—a bit less sweet than the agave syrup–influenced Ultra. The next step is to see how Cristalino becomes officially classified. No one is sure whether that will happen, but the Official Standard for Tequila is reviewed every five years, and 2017 is a review year. Under that process, producers put forward ideas on changes to the current standard and offer a consensus proposal to the Mexican government, which makes the final decision. Some distillers want to make Cristalino the sixth class of Tequila along with Silver or Blanco, Gold, Reposado, Añejo, and Extra Añejo. Others argue that another classification might confuse consumers. It’s likely that Cristalino will gain an official standing, but not without much debate. 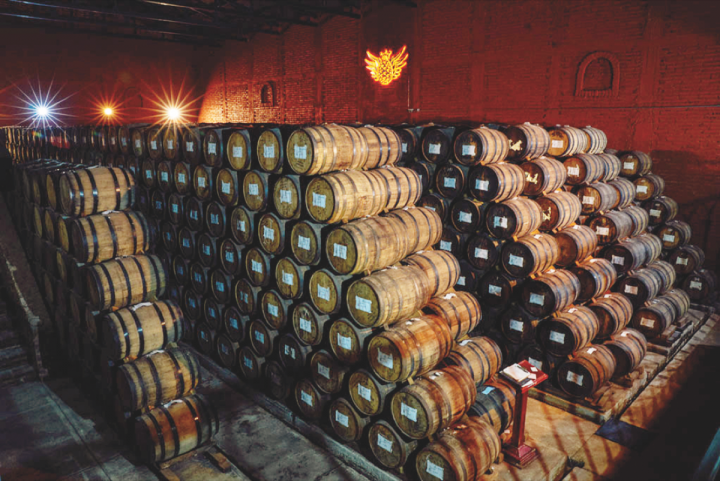 While high-end Tequilas like Avión (barrel room pictured) have led the way in burnishing the category's luxury image, the industry's more mainstream labels are also thriving. Tequila’s premium tier ($15 to $25 a 750-ml.) is also thriving. Jose Cuervo and Sauza dominate this segment, together accounting for nearly 6 million cases of the 7.4 million–case premium total. Since losing about 10 percent of its volume from 2005 to 2013, Jose Cuervo has undergone a renaissance. Last year, the brand rose by 4.3 percent to 3.6 million cases, according to Impact Databank. Sales of Cuervo Silver have been healthy, and the brand has also been lifted by the performance of the more upscale 100-percent agave Jose Cuervo Tradicional Silver, barrel-aged for one month and based on a recipe from Casa Cuervo’s founding year of 1795. Sauza, the premium tier’s second-largest player, also posted healthy growth last year, rising 7.4 percent to 2.25 million cases. Sauza master distiller Fernando Avila is bullish on Hornitos Black Barrel ($30 a 750-ml. ), which is finished for four months in charred oak and targets the whisk(e)y-drinking demographic. Other premium brands, such as Herradura’s El Jimador brand (up 16.7 percent last year) and Heaven Hill Brands’ Lunazul (up 22.7 percent), are also performing well. Heaven Hill president Max Shapira predicts Lunazul will reach 200,000 cases this year, up from 135,000 cases in 2016. Lunazul is produced in a joint venture with the Tierra de Agaves estate owned by Francisco Beckmann, brother of Cuervo owner Juan Beckmann. At all tiers, Tequila abounds with creative new players. New to the scene is Código 1530, which launched late last year. Código’s cofounders are Mexican entrepreneur Federico Vaughn and Crocs Footwear executive Ron Snyder, who built the shoe brand into a global powerhouse. The portfolio includes Blanco ($49 a 750-ml. ), Reposado ($69), Añejo ($119) and Origen Extra Añejo ($249) variants, as well Rosa ($65), finished in Napa Cabernet barrels. After launching in Texas, California, Tennessee and Colorado last year, Código 1530 expanded into New York, Illinois, Nevada and Missouri this year and expects to be in 20 states by autumn. The Tequila shelf is increasingly crowded, but retailers are starting to devote more space to this still-emerging category. The level of international investment, coupled with current growth trends, bodes well for the category’s future. Today, sophisticated drinkers discuss Tequila in reverential tones once reserved for luxury wines, whiskies and Cognacs. But there are many who have yet to be converted—and a host of high-end players that are aiming to do just that.